We are always looking for great breakfast ideas, as so many of the usual breakfast recipes tend to be high in sugar. Many of these breakfasts lead to a high spike in insulin leaving us hungry during the morning hours of work or school when we need to be productive. This is a great recipe that I adapted from Oprah Magazine. I love that that this breakfast recipe includes some veggies, which is also missing in many breakfast options. For kids especially, adding serving of fruit or vegetables at breakfast can help them get closer to the goal of 5 servings per day. An extra source of protein and energy in this recipe is quinoa. This is great to have on hand already cooked and stored in the fridge. Bring 1 cup rinsed quinoa to a boil with 2 cups water or broth. Bring heat down to a simmer and cook for 15 minutes until the little thread or "belt" is released. Use in breakfast recipes, in bean burgers or even mixed into a salad. Note that although this is a great breakfast recipe, I have whipped this up as a quick dinner, too! In a medium bowl, whisk eggs and salt. Heat oil over medium heat in a large nonstick skillet. Add eggs and begin to scramble lightly. White still soft add quinoa, spinach and tomato, and continue to scramble. Stir continuously over lower heat for another 3-4 minutes until eggs are set. Remove skillet from heat. 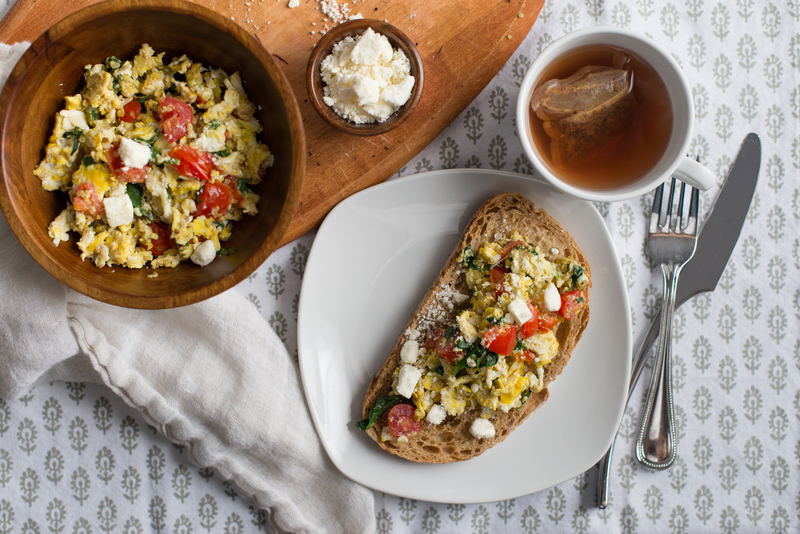 Divide among 4 plates and top each with 1 tablespoon feta cheese. Serve over whole grain or gluten free toast or in your favorite wrap. Eggs can be a great food for new eaters. It's a great source of protein, it's soft and easy to fold up veggies into eggs. When first introducing eggs cook them thoroughly. Previously parents were told to avoid eggs in babies, but now eggs are considered a good first finger food. Talk to your pediatrician if you have concerns about food allergies, or if there is a family history of food allergies before introducing eggs to your baby.